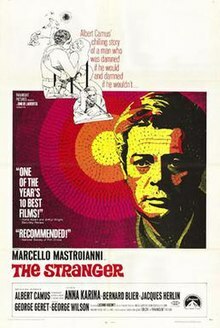 The Stranger (Italian: Lo straniero) is a 1967 film by Italian film director Luchino Visconti, based on Albert Camus' novel L'Étranger, with Marcello Mastroianni. Mersault's friend Raymond beats his girlfriend and is sued by her. In court, Mersault testifies to his friend's advantage. Raymond is off the hook, but now his girlfriend's male relatives stalk Mersault. He shoots one of them and ends up in prison. Alain Delon was originally announced for the lead. ^ "NY Times: The Stranger". NY Times.com. Retrieved 2009-03-22. ^ The Devils' Get a Movie Angel By A.H. WEILER. New York Times (1923-Current file) [New York, N.Y] 21 Nov 1965: X11. This article related to an Italian film of the 1960s is a stub. You can help Wikipedia by expanding it. This page was last edited on 4 November 2018, at 03:29 (UTC).